This time, however, it was different. I didn’t feel the anxiety of rushing to catch a flight but there were still knots in my stomach.This time, on the Howard Beach bound A train, I didn’t have a suitcase, either. Instead my bag held my heavy copy of the Immigration and Nationality Act and my cell phone charger. This time, I was headed to the airport in a different role. Late in the afternoon of Friday, January 27, 2017, President Trump signed an executive order entitled “Protecting the Nation from Foreign Terrorist Entry into the United States.” Among other items, this executive order suspended the U.S. refugee admissions program (USRAP) for 120 days and halted the admission of Syrians as refugees indefinitely. Additionally, the President’s executive order also imposed a 90-day ban on entry for individuals from Iran, Iraq, Libya, Somalia, Sudan, Syria, and Yemen. The executive order provided a narrow exception allowing for the issuance of immigration benefits or visas to individuals from the above-named countries on a case-by-case basis if it was in the national interest. Further, the executive order allowed for additional countries to be added to this list at any time. Many portions of the order were unclear, such as whether this ban would impact green card holders, dual citizens or dual nationals, or would require the Department of State to stop issuing visas or the United States Citizenship and Immigration Service to cease adjudicating immigration petitions for individuals from these countries. The immigrant community felt the impact of the executive order immediately. Individuals from the seven countries who were in transit at the time the Executive Order was issued were detained upon arrival at JFK International Airport and other airports throughout the country. As an immigration lawyer and a person who has devoted her professional life to serving the public interest, I could not remain idle. I planned to attend a vigil at on Saturday night, but jumped on the A train much sooner than I had originally planned, law books in hand. I met friends from our NYC Bar Committee in the arrivals hall of Terminal One. We spoke with an Iranian student who was awaiting news from his wife who had been detained since her flight landed early on Saturday morning. We spoke with a Yemeni-American family who had been waiting for their 85-year-old disabled father-in-law, a lawful permanent resident or “green card” holder, for more than 12 hours. And we spoke with an Iranian-American woman waiting for her brother, also a “green card” holder, for what seemed to be an eternity. As a team, we drafted habeas petitions for several Iranian students trying to return to the United States to continue their students at NYU and SUNY; a Sudanese doctor coming back from a holiday visiting her family in Saudi Arabia to return to work at the Cleveland Clinic; and the “green card” holding members of the Yemeni-American and Iranian-American families. Volunteer attorneys who were admitted to the Eastern District (EDNY) filed the petitions electronicallyWe anxiously awaited word from the EDNY, and were excited when Judge Ann M. Donnelly issued a temporary stay in a 3-page decision in response to a lawsuit filed by the ACLU challenging the detention of two Iraqi men. This allowed for some of the individuals we were helping, through their family members, to finally leave the airport hours later. However, some, including the Sudanese doctor, were forced to either withdraw their requests for admission or be deported. 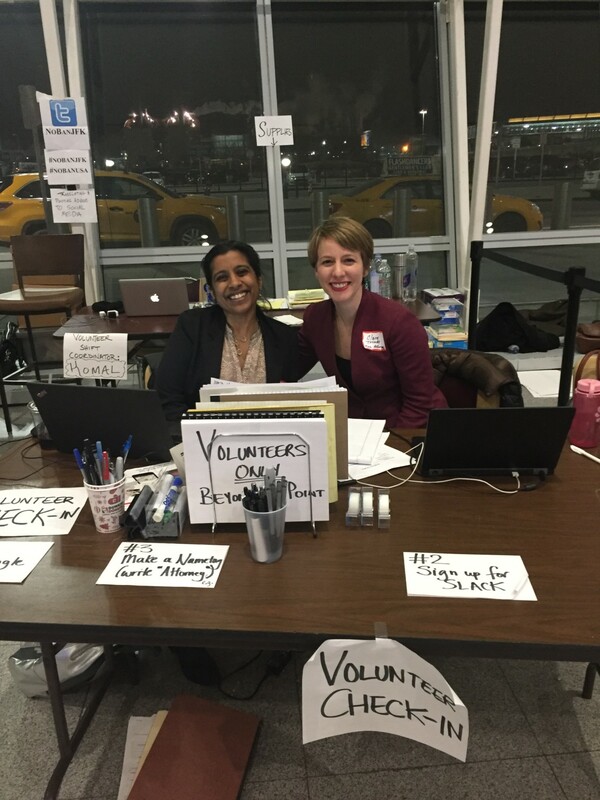 On Sunday, attorneys set up a functioning law office in the seating area surrounding the Central Diner in Terminal 4 Arrivals Hall, complete with printers and snacks. Coordinators put up a website and phone number for worried travelers and their family members to call for advice and counsel. Airport coordination efforts quickly sprang up with volunteer lawyers at international airports throughout the United States. I returned to JFK at 11 PM on Wednesday, February 1st, for the overnight shift, with signs made by New York Law School students in Arabic and Farsi stating “Free Immigration Lawyer.” My former colleague from the African Services Committee joined me. Together we staffed the phones and emails and answered questions from anxious travelers and family members. It took on average three to six hours for individuals from the seven countries named in the executive order to pass through immigration and customs. By the time our shift ended at 6 AM on Thursday morning, we found that in reality, individuals from over twenty countries were impacted by the executive order because of increased questioning and subsequent delays throughout the inspection and admission process at JFK. Before, the airport was where I felt at home. Now, after assisting mistreated individuals, including children, the elderly, and disabled, the airport for me now embodies the dysfunction of our immigration system, literally operating behind closed doors, rife with the unchecked privilege of agents to humiliate and denigrate as they see fit. As the battle over the two executive orders continues to wind its way through the courts, I remain on call to return to JFK, to help in any way I can. TOP PHOTO CREDIT: Claire Thomas/ New York Law School students, Melissa Salama and Halah Elchorbagy make signs for airport lawyers in Arabic and Farsi.